resident did it again... great stuff with genius coding... thanx guyz..
the tunnel part must look really cool on the bigscreen..
rulez added on the 2006-03-08 01:25:20 by chenmy! what a great textmode demo! need to say something ? just perfect! rulez added on the 2006-03-08 11:02:33 by AbcuG! that was first text demo in turkey demoscene and it was very kool. we love you people. Enjoyed the oldskool structure to the muzak..
definitiv nice... I am addicted to textmode demos ! @Optimus: There was a time limitation (I think it was 4 minutes) for the demo compo. Spritus told me that the demo was much longer and there were more effects. But they had to cut out some parts unfortunately. It's not their fault. It's about compo rulez. @Skate: Time limit was 5min. Some parts were discarded because deadline was near and i didn't just wanted to throw them without polishing. Amazing! The tunnel & cubes are really cool! That one is really great compared to other Resident stuff. yes, this one is a very very nice demo. Keeps you alert and waiting for the next part. The best ASCII I have seen. Congratulations ! ++ ++ ++ + Nice effects. + +++ +++ + Good Music. ++ ++ ++ +++ work. 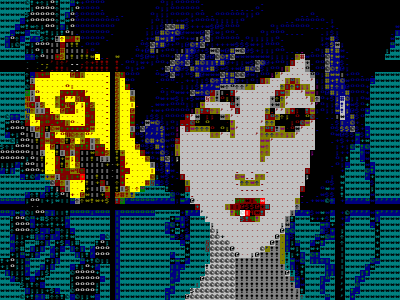 Maybe not the best textmode ever, but pretty damn good anyway. Great progress from Resident on this one. From the orchestra hit at the start you know you're in for a great ride.. probably the best textmode demo around. Cool text mode demo! I like it. Nice music too. Thumb up. Wow! Lots of great effects, some nice transitions, and awesome music. The rendering looked a little messy in one or two places, but not a big deal. Sweet stuff. Lo-fi rendering is not meant to hide uninteresting effects and doesn't improve bad music nevertheless. Try harder. watched it again, it was an higlight! textdemo to make me happy! excellent ! impressive ! awesome ! amazing ! Great textmode demo, the tunnel and cubes scene was particularly nice. Not my favourite ever, but some really great stuff in this one. page created in 0.020297 seconds with 15 queries.